President Donald Trump's executive order suspending entry to the U.S. by people from six Muslim-majority nations could reduce the number of doctors in areas with high percentages of Trump supporters, according to researchers at Harvard Medical School and MIT. Swaths of Appalachia and the Rust Belt could be disproportionately affected, the researchers who analyzed data about physicians in the United States found. As many as several hundred doctors from the six countries affected by Trump's new executive order will not be able to begin medical residencies this year unless waivers are granted, Atul Grover, executive vice president of The Association of American Medical Colleges, told NBC News. The AAMC is still calculating the precise number of doctors directly affected by the latest ban and is expected to release a breakdown within the week. Residency programs are a pathway for foreign-born doctors to become physicians in the U.S. and have played a critical role in preventing doctor shortages in rural and low-income areas. The new research from economists and medical professionals at Harvard and MIT found that doctors from the countries affected by Trump's latest immigration-related executive order — Iran, Somalia, Sudan, Yemen, Syria and Libya — have tended to cluster in states like Indiana, Michigan, Ohio, Pennsylvania and West Virginia. Residents of working class areas in those states tend to have higher incidences of health problems like obesity, diabetes, and alcoholism and also tended to give Trump big boosts of support in the election, according to The Economist. As the below maps show, doctors from the six affected countries have tended to serve these areas. Many foreign-born doctors end up in states and areas Trump won through visa programs Monday's order will suspend when it takes effect March 16. 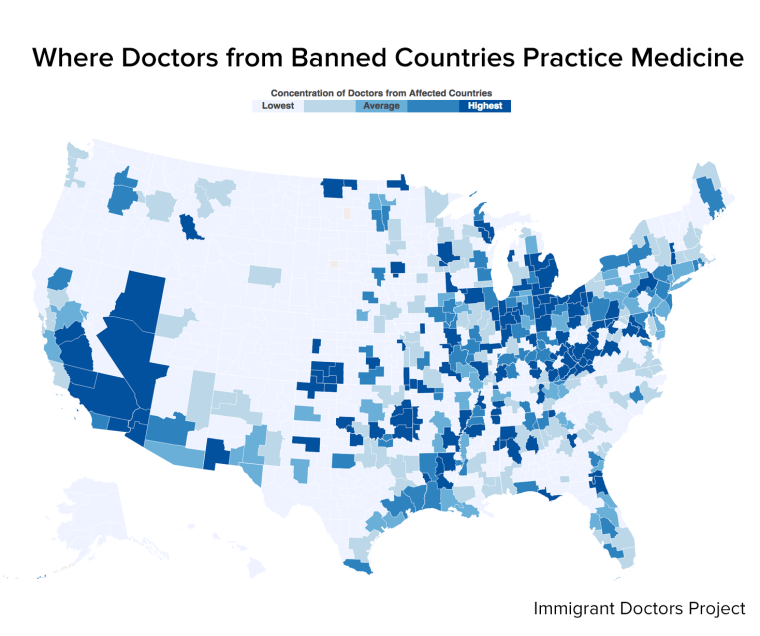 "In these places, there are lots of incentives for American-trained doctors and foreign-trained doctors to move and work," said Michael Stepner, a doctoral student in economics at MIT, who helped analyze where foreign-born doctors live. As a result of the incentives, previous research has found foreign-born workers are more likely to take jobs in places underserved by medical professionals. More than 25 percent of doctors and surgeons were foreign-born as of 2010, according to data from the Migration Policy Institute. Graduate departments in science and engineering reported that international student applications for many programs declined by 20 to 30 percent for 2017 programs. As a result, some universities, such as Dartmouth and the University of Massachusetts in Amherst, have shifted their recruitment strategies to avoid a talent drought. Last week, the Trump administration made a separate announcement that it is ending an expedited visa process designed to speed approval of H1-B visas, which are granted to highly skilled foreign workers. Many of the physicians who complete medical residencies in the U.S. rely on the H1-B visa to practice medicine in the country afterwards.